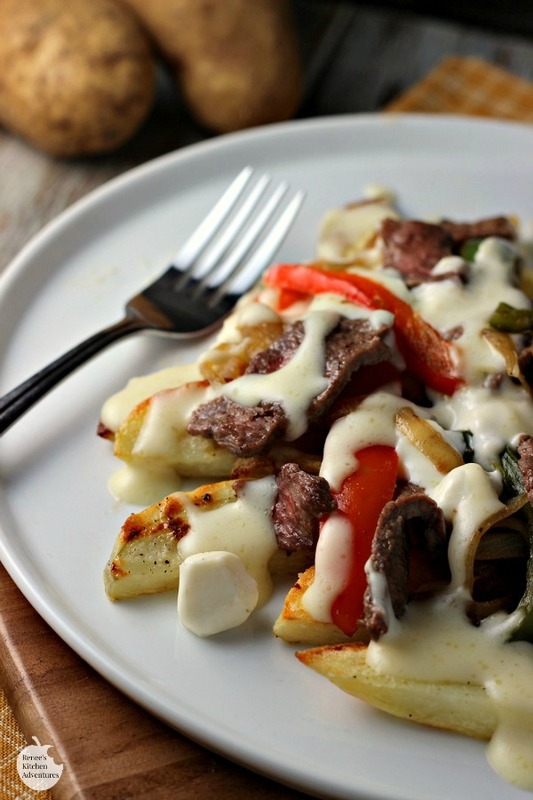 Philly Cheesesteak Poutine is a fusion of two regional favorites morphed into one delicious dish! 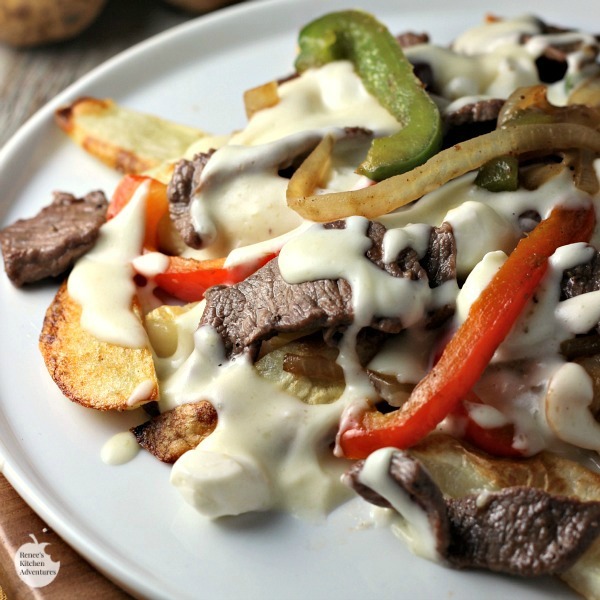 In this "classic poutine meets classic Philly Cheesesteak" recipe, oven baked Idaho® potatoes are topped with tender seasoned steak and grilled onions and peppers, then covered in a rich cheese "gravy" and topped with fresh mozzarella pearls! YUM! Are you familiar with poutine? 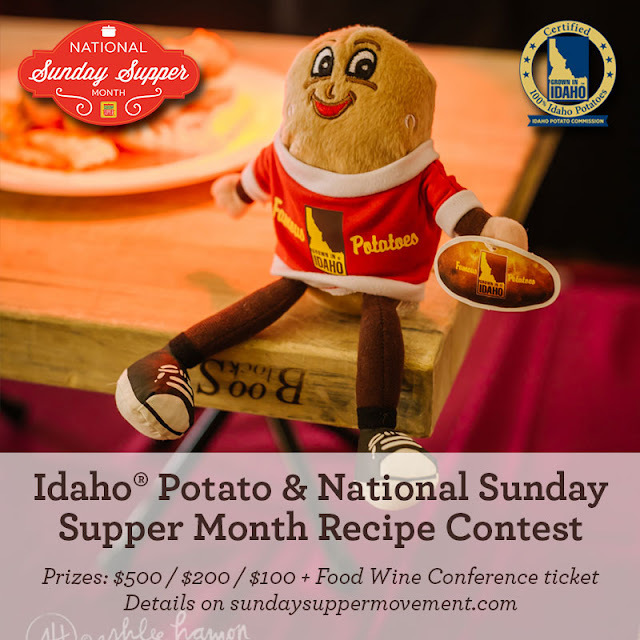 This month, to help celebrate National Sunday Supper Month, Sunday Supper and the Idaho® Potato Commission are having a poutine recipe contest, Let's Poutine, and this beauty right here is my submission! CLICK HERE to find out more about the contest and how you can enter to win too! I'm planning on attending the Annual Sunday Supper Food and Wine Conference May 13-15, 2016 and the prize includes a ticket to this fun and informative event! (Fingers crossed!) It's being held in Orlando, FL this year and has a wonderful line up of events planned. Although I practically live right next to Canada, this is my first exposure to poutine and let me tell you, it certainly won't be my last! If you aren't familiar with it, poutine generally consists of potatoes, a brown gravy and cheese curds. It's a French-Canadian classic that is loved by all! My twist on this classic dish is easy enough to make as a weeknight dinner. I oven-baked the potatoes because I prefer potatoes cooked this way over frying. You will need to do a little planning when you make these, as the potatoes need to soak in cold water before baking. By doing this, you remove a bit of the starch in the potato and that makes them super crispy on the outside and fluffy on the inside when you bake them in the oven. It's a step you don't want to skip! For the steak, I used flat-iron steak. It's a relatively inexpensive thin cut of beef with great flavor and cooks up tender in a very short time. I think it's the perfect choice for this poutine. The "gravy" in this recipe is a simple cheesy white sauce and for the curds, I've used fresh mozzarella pearls. They melt easily and get very ooey gooey (that's a good thing!). If you love poutine, give this recipe a try! If you've never had poutine, give this recipe a try! Classic cheesesteak and classic poutine never had it so good! Crispy oven-baked Idaho® russet potato fries are covered in tender steak, grilled onions and peppers and smothered in a cheesy gravy then topped with fresh mozzarella pearls! Heaven! Soak potatoes in cold water for about 30 minutes. This will remove some of the starch and allow the fries to bake up crispy on the outside and fluffy on the inside. Drain well and pat dry with a paper towel. Preheat oven to 425 degrees F. Coat well dried off potatoes with 1 TBS olive oil and arrange in single layer on sheet pan. Sprinkle with salt and pepper. Bake in oven for 30-40 minutes, turning over once during cooking until potatoes are golden brown. While fries are baking, heat large skillet over med-high heat. Add 1 tsp. olive oil. Season beef strips with salt, pepper and garlic powder. Cook beef strip in hot oil until just browned. Remove to plate and keep warm. Add another tsp. oil to pan and add in the peppers and onions. Salt and pepper veggies. Stir around and cook until soft. Take off heat and set aside. In medium sauce pan, melt butter over med heat. Whisk in flour and cook for 1 minute. Slowly whisk in milk and stir until sauce begins to thicken. Whisk in mustard. Take off heat and add in the provolone and Parmesan cheeses. Taste for salt and add as needed. To assemble poutine: Place 1/4 of fries on plate. Top with 1/4 of the meat, 1/4th of the onion pepper mixture and drizzle on 1/4th of the cheese "gravy". Top with a few fresh mozzarella pearls. Repeat with remaining ingredients. Serve warm. Wow, that brings poutine to a whole new level. I would love to dive right in!! Thanks Tara! That means a lot to me coming from a Canadian who is familiar with poutine! I did! haha Thanks Sheena! Me too Carrie! That's how I got the idea! Thanks so much! I've never tried poutine before but always wanted to... this philly cheesestake version looks absolutely amazing!! Thank you. I have never had poutine before either, but I really loved this version! Wow! that looks amazing. Poutine really is not a British thing, but something that I need to try. I've never had it before this either. I'm glad you like it! 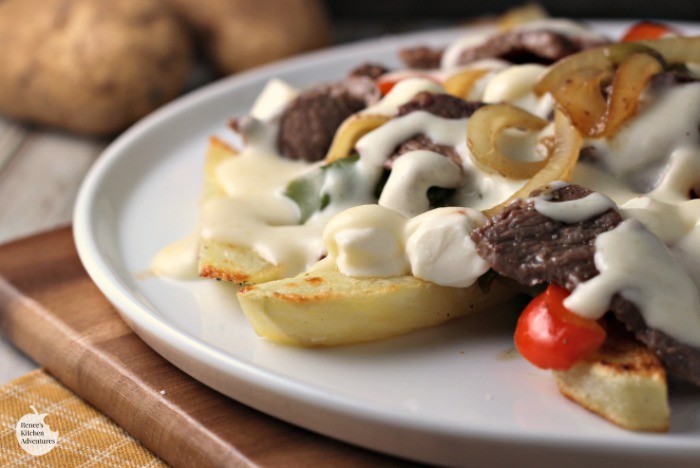 This is such a clever spin on Philly Cheesteaks! I will definitely have to give it a try - it might make into the weeknight dinner rotations it looks so delicious! I can't believe I've never had poutine! Your photos -- wow! They are making me seriously hungry. I can't wait to give this recipe a try! This was the first time I'd tried it too. I hope you like it as much as I did! Poutine is a favorite of mine, and this one looks AWESOME!! this looks ridiculously indulgent.. and I want a big bowl right now! Thanks!! It was very, very good!